Dot 1943 rescue. S/N 2002 all matching (what’s left). Sporterized but being converted back. Last edited by robyoung20; 05-05-2018 at 08:05 PM. IO import marked, bolt and trigger guard mis-matched. Has matching SMUB and SLB. Proofs pinged but readable. It came in a mis-matched, red glue, laminate stock with a weird cross bolt. Not sure if it is post war or not. 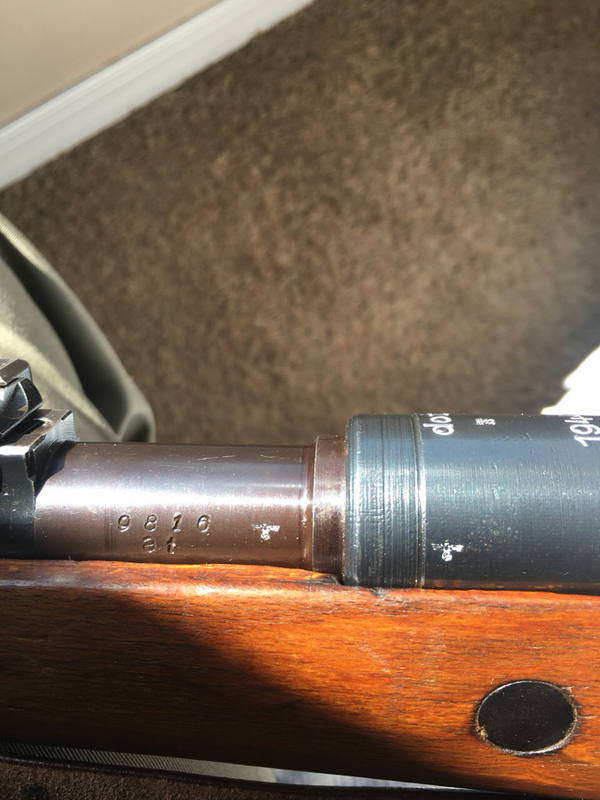 Has a faint Wa63 proof on the sear but the trigger, bolt stop, rear sight base, ladder and sight are all without proofs or, serial numbers. Not sure it this is correct for a Brunn I of this era or not. I have a unserialized byf Stamped w/ lock screw trigger guard w/ stamped floorplate (ser #'d) coming for it. I also have a matching to itself phosphate, oval vent bolt w/ a 1 on the underside of handle root and e coded safety and cocking piece I will use on it if kosher. The bolt it came with was mismatched and pretty crudely scrubbed of its proofs which lead me to believe this was a Romanian import. Last edited by WpnsMan; 01-22-2019 at 01:04 PM. In Search Of Semi-Kriegsmodell dou 44 Stock For Sale. Another number for your research. I have 1944 dot 2909w. Complete with hood/sling. Matching, 90% condition. I have a dot 1944, posted on Gunboards and I will post here in a minute. It's serial number 20597 and is a bolt mismatch from Gunbroker, no sight hood but came with an apparently original sling. No cleaning rod hole in the stock but otherwise normal unfinished, unsanded stock.